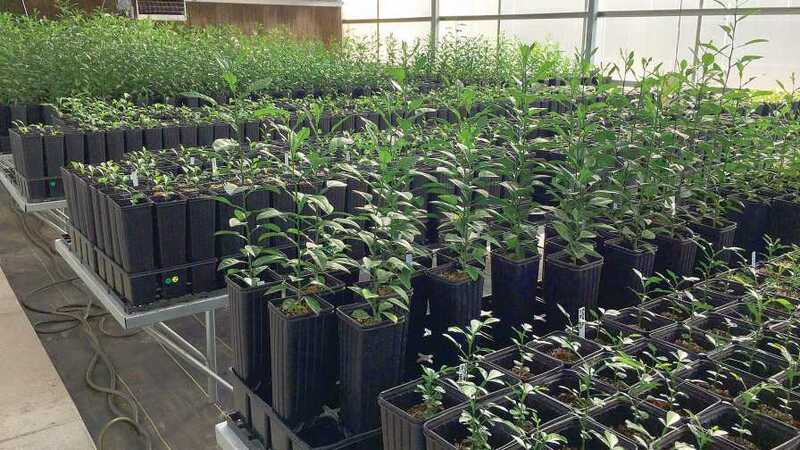 New Phase II greenhouse liners are used to increase propagations and biological indexing inside the Florida Bureau of Citrus Budwood Registration’s facility in LaCrosse, FL. 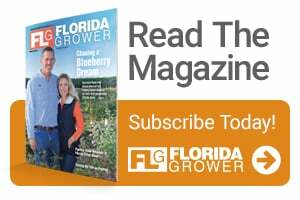 Nothing is more foundational to a healthy and vibrant Florida citrus nursery segment than services provided by the Florida Department of Agriculture and Consumer Services (FDACS) Bureau of Citrus Budwood Registration. The Bureau maintains facilities in Winter Haven, Chiefland, and LaCrosse. 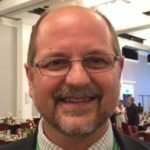 As highlighted in my “Citrus Nursery Source” feature from last spring, programs operated at these facilitates help ensure a reliable, safe source of foundation budwood. They also register and monitor nursery budwood source trees (scion and increase). In the summer 2014, FDACS’ Bureau of Citrus Budwood Registration completed Phase I of its LaCrosse facility, followed with a Phase II opening in fall of 2016. Since that time, work has continued to expand capacity, train staff, and bring all aspects of the facility online. Here is a snapshot of the breadth and scope of activities at the LaCrosse facility and how it is serving Florida’s citrus industry. LaCrosse staff operate two on-site programs, the first of which is the Citrus Germplasm Introduction Program (CGIP). The CGIP program receives all foreign and out-of-state germplasm. Once at LaCrosse, the inbound material receives therapy to ensure it is free of all known diseases. Therapies may include shoot tip grafting and/or thermal therapy, biological indexing (grafting onto an indicator plant for observation), and laboratory testing. A number of factors, including the origin of the material, known risk factors, and visual inspection help determine which therapies are required. The second program administered within the LaCrosse facility is the Parent Tree Program (PTP). The PTP receives material from in-state sources (primarily breeders) and produces clean, disease-free material for use in budwood increase and nursery propagations. The PTP process begins in Winter Haven. Once the Winter Haven facility has completed its work, it transfers shoot tip grafted trees to LaCrosse. Once in LaCrosse, the plants undergo laboratory testing (molecular indexing) and biological indexing. CGIP and the PTP programs supply clean trees to the Chiefland foundation block, which in turn supplies the industry. The Winter Haven facility transferred its first 40 introductions to LaCrosse in 2018. Beginning in 2019, the CGIP program will have the personnel in place to function at its designed capacity. The program will accommodate 24 citrus selections per year. This will nearly triple the number of CGIP introductions per year since the program moved to LaCrosse in 2014. The PTP also is running at full capacity and will transition to LaCrosse in early 2019. The only PTP function that will remain in Winter Haven will be shoot tip grafting. LaCrosse also is responsible for all testing of nursery scion groves, increase blocks, and trees in the Chiefland foundation block. This past year, more than 55,000 qPCR targets were tested in fulfillment of this mission. An example of a new, low-seeded mandarin from USDA-ARS, shown at the Dec. 13, 2018 Field Day at Whitmore Farm in Florida. 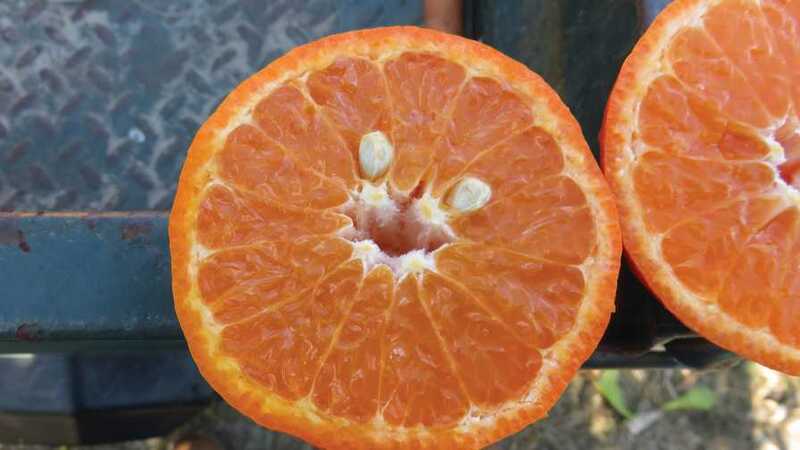 Growers, packers, and nurserymen recently gathered at the A.H. Whitmore Farm to sample and score some of the latest USDA-ARS citrus selections. Numerous low-seeded and seedless mandarin selections were shown, as well as the recently released ‘US Sun Dragon’ hybrid and two grapefruit hybrids. Attendees were asked to complete a survey covering various aspects of fruit quality and marketability. The HLB-tolerant, orange-like ‘US Sun Dragon’ was released as a public domain variety, with dooryard and niche commercial target markets. However, ‘US Sun Dragon’ also is being used in crosses that may have future value in juice processing. The Whitmore Foundation Farm is a tremendous resource that supports a range of citrus industry research projects. It is a secure facility in Lake County, and these field days are a great opportunity for industry professionals to see the work being done there. The last scheduled UF/IFAS Variety Display for 2018-2019 is Feb. 19 at the Citrus Research and Education Center (10 a.m.).